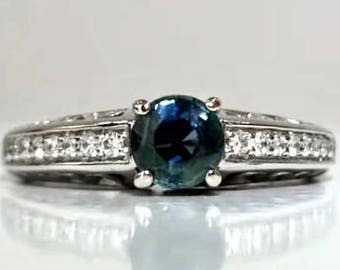 1.14 ctw Sapphire & Diamond Engagement Ring in 14K White Gold / Natural Blue Green Sapphire / See Video! / De Luna Gems / Free Shipping! This dazzling engagement ring features a natural, untreated .92 carat Sapphire with a halo of .22 ctw brilliant Diamonds in 14K White Gold. This spectacular Blue Sapphire with blue-green hues is a rare and exquisite find! All of my jewelry is complete and ready to ship. Your chosen piece will arrive beautifully gift wrapped and elegantly packaged. If you require resizing services, please message me prior to purchase to confirm sizing is possible and if any additional charges may apply. Allow up to 7 business days for resizing/customization of your ring. Customized rings cannot be returned. Please see store policies for additional details. Thank you for visiting De Luna Gems! You promised her the moon... We Deliver! 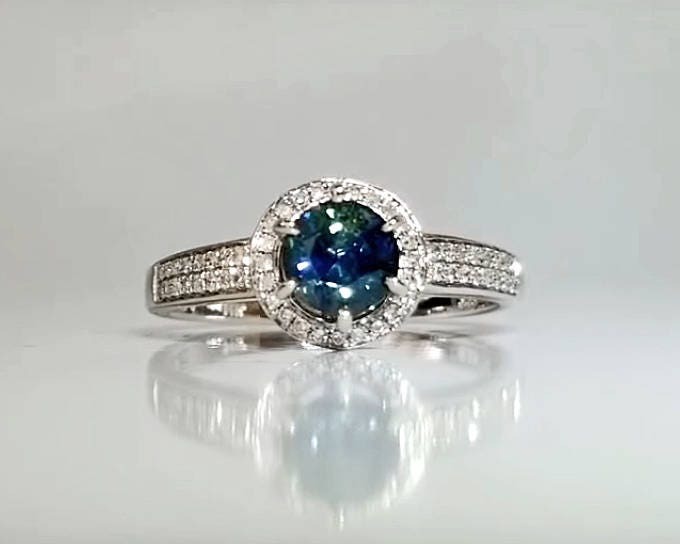 1.14 ctw Sapphire & Diamond Engagement Ring in 14K White Gold / Natural Greenish - Blue Sapphire / See Video / De Luna Gems / Free Shipping! 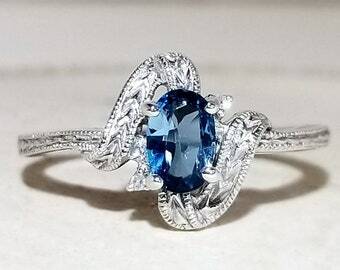 1 ctw Sapphire & Diamond Ring in Sterling Silver / Natural Blue Ultraviolet Gemstone Engagement Ring / De Luna Gems / Free Shipping! 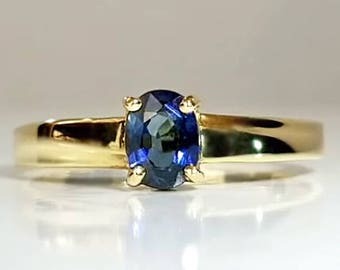 1/2 ct Sapphire Engagement Ring in 14K Yellow Gold / Natural Blue Sapphire Gemstone Ring / See Video! / De Luna Gems / Free Shipping! 5 ct Blue Green Sapphire & Diamond Ring in 18K White Gold / Unique Estate Engagement Ring / See the Video! / De Luna Gems / Free Shipping! 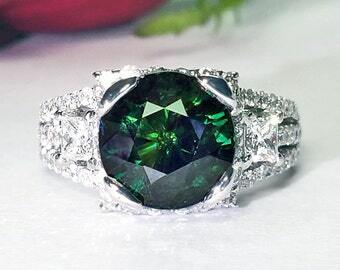 1.2 ct Emerald in Sterling Silver Ring / Natural Untreated Pear Cut Emerald Engagement Ring / De Luna Gems / Free Shipping! My wife loved this ring for Valentine’s Day! It also arrived with a beautiful necklace and a ring pop! Excellent service would shop from this seller again! 10 ct Amethyst & Moonstone Ring in Sterling Silver / Purple Ultraviolet February Birthstone Statement Ring / De Luna Gems / Free Shipping! Stone is a little smaller than anticipated but beautiful nonetheless and the packaging is so thoughtful and pretty! Yellow Diamond Engagement Ring in 14K Yellow Gold / Unique Solitaire Engagement or Valentine Promise Ring / De Luna Gems / Free Shipping! I couldn't be happier with this ring. 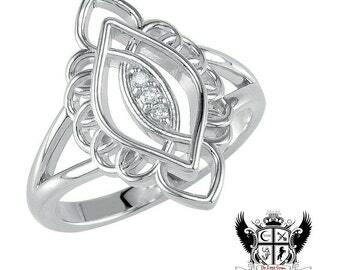 I have taken my time in looking for something just like this so when I came across this ring I was thrilled. Andrea promptly had it sized and mailed all within one week. I've waited 2-3 weeks just for sizing! It also came with a certificate of authenticity and I know I got a great deal. It looks beautiful on and I just love it. This was my first time purchasing from De Luna Gems and I would not hesitate to purchase again. Thank you, Andrea! 20 carat Pink Kunzite & Diamond Vintage Statement Ring in 18K White Gold / De Luna Gems / Free Shipping! I accept payment by Direct Pay, PayPal, and Etsy gift card. I want your satisfaction and faith in the quality of my products. If you have any concerns, I will make every effort to work with you to resolve them to ensure your satisfaction. If you are not fully satisfied with your purchase, you must contact me within 3 calendar days of delivery to qualify for a refund/exchange. After 3 calendar days of delivery, all sales are Final. However, if there is an issue with your jewelry, please contact me for assistance anytime. Once a return is confirmed with us, you may return the item, postmarked within 7 calendar days for a refund or exchange (Less 15% Restocking fee). Item must be returned with all original packaging and Buyer is responsible for return shipping and insurance costs. **Please be aware, by "Refusing" delivery of a package, there is no insurance or often no tracking on the returned item. Buyer is responsible for all liability if the package is damaged or lost. All of my jewelry is complete and ready to ship unless otherwise stated. If you have requested special services, please allow up to 10 business days for your order to be shipped. Your item will be mailed within 1-3 business days after your payment has been verified. I ship within the United States by USPS First Class Mail with delivery confirmation and insurance. Expedited shipping is also available at standard rates if you need your item rushed. Please let me know when you select a shipping upgrade if you have a specific delivery date you are trying to meet. I will make every effort to expedite the process and ship your item to arrive in the time that meets your needs. I am always available to help you have the best shopping experience possible and to ensure that all your questions will be answered promptly - normally within 24 hours. I make every effort to show true gem colors, but due to the monitor limitations, the product image may show slight differences to the actual product in color saturation, tone or hue. If in doubt, please ask! All of my jewelry is complete and ready to ship. I consider each piece to be a new cherished heirloom and take pride and care in presentation. I thoroughly inspect and complete a final cleaning/polishing of each item to ensure your jewelry item is far beyond your expectations. Finally, I prepare your jewelry for delivery with elegant gift-wrapping and careful protective packaging. It will be ready to be proudly presented to its new owner. Thank you for visiting my store and choosing De Luna Gems! It is my honor to be your Jeweler. My jewelry is finished and ready to ship unless otherwise stated. All custom and personalized items, including resizing, are non-refundable and sales are final. Please contact me prior to purchase if you need resizing services- pricing varies based on style and some ring styles can't be resized. Please add up to a week to listed shipping times for resizing work to be completed. Discounted/Sale items, custom and personalized items are Non-returnable. You must notify us within 3 days of delivery to request a returns or exchange. Any return must be postmarked within 7 calendar days of delivery. All Returns will incur a 15% restocking fee. Return shipping and insurance is buyer's responsibility. Most natural gemstone should be gently cleaned with non-detergent soap and a gentle toothbrush scrub. Generally, avoid ultrasonic or steam cleaning. Better safe than sorry. I highly recommend a visit to GIA.edu for detailed info on your particular gemstone. We do not offer layaway or payment plans but recommend PayPal Credit as a convenient and safe option to pay at your convenience. 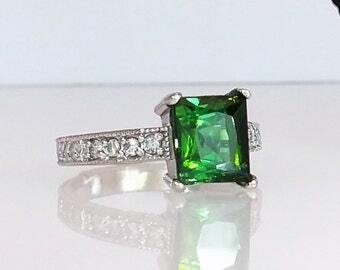 3.9 ctw Blue Green Tourmaline & Diamond Ring in 14K White Gold / Rare Natural Indicolite Engagement Ring / De Luna Gems / Free Shipping! 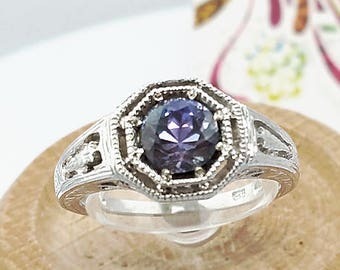 Sapphire & Diamond Ring in Sterling Silver by De Luna Gems / Free Shipping! 1.5 ct Bluish-Dark Green Tourmaline in a Floral Vine Steampunk Statement Ring in Sterling Silver / De Luna Gems / Free Shipping! Pink Tourmaline Marquise Cut Solitaire Engagement Ring in Sterling Silver / De Luna Gems / Free Shipping! 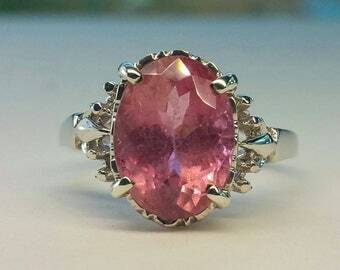 2.35 Pink Tourmaline and Diamond Ring in Sterling Silver / Natural Pink Gemstone Engagement Ring / De Luna Gems / Free Shipping! 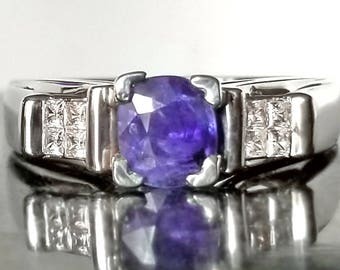 6 ct Tanzanite & Diamond Engagement Ring in 14K White Gold / Vintage Setting Oval Gemstone Ring / See Video! / De Luna Gems / Free Shipping! 1 ct Tanzanite Ring in Sterling Silver / Natural Blue Gemstone Engagement December Birthstone Filigree Ring / De Luna Gems / Free Shipping!